When you’re in the mood for a spicy, robust and savory egg dish that’s not only perfect for breakfast, whip up this simple Shakshuka Spanish Style for any meal—it’s packed with spices, peppers, onions, and a sprinkle of manchego cheese. Here’s a little confession for you: I am not a fan of eggs. Isn’t that weird? I mean, who doesn’t like eggs? 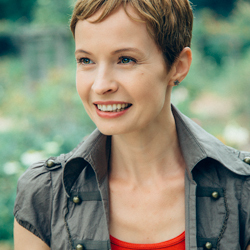 I’m a little embarrassed to admit this to you as a recipe developer and personal chef—a “foodie”— but it just goes to show that all of us have our “thing”, our idiosyncrasies, and this is one of mine. 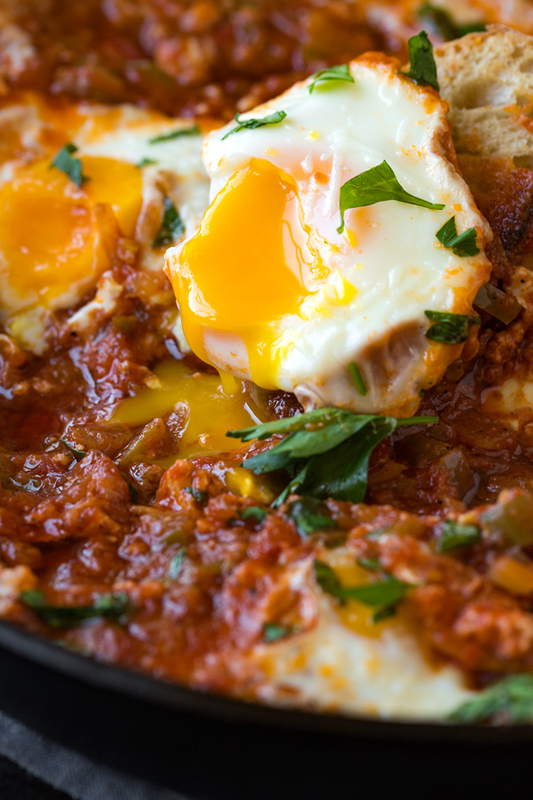 Because this shakshuka recipe is definitely worth sharing. And because I love my hubby. See, my hubby is a total “egg head”, and loves eggs pretty much on everything; and I knew he’d fall hard for this gorgeous dish, which, in fact, he did. He tasted it, closed his eyes, and said, “I think this is one of my favorite dishes—not just egg dishes, but favorite dishes in general…” And that couldn’t have made me happier. Also, I’d like to be a good girl and continue to expand my own horizons—push my personal envelop and comfort zone, and tastes. 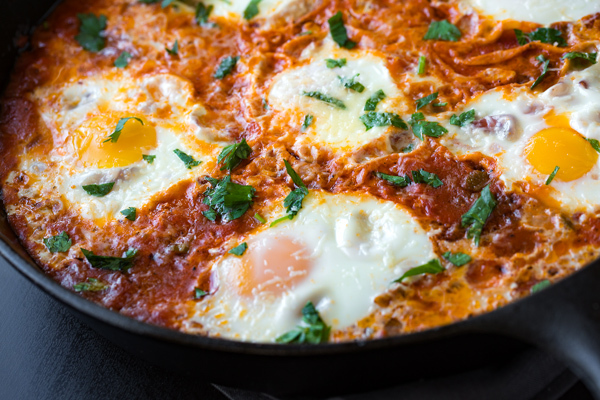 I knew that if there ever was an egg dish that I could truly enjoy, then this beautiful and tempting Shakshuka would be it; because these wouldn’t be “naked” eggs I’d be eating, but ones dressed and slathered in a spicy and rich red sauce (which I love! ), with hunks of rustic bread to dip into all of that goodness (which I love!). And I’m happy to report, it worked. True, I do go a bit heavier on the sauce than the eggs…but baby steps, folks, baby steps! 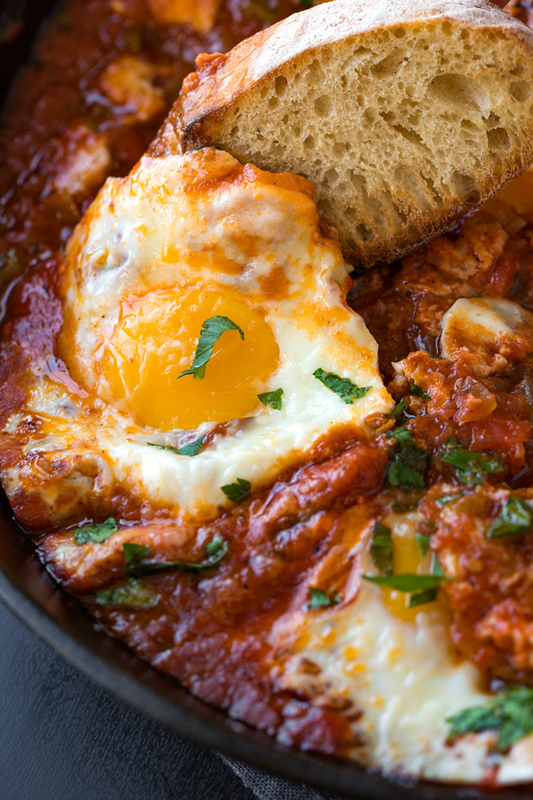 So, What Is Shakshuka (besides Being a Sort of Funny Sounding Word)? 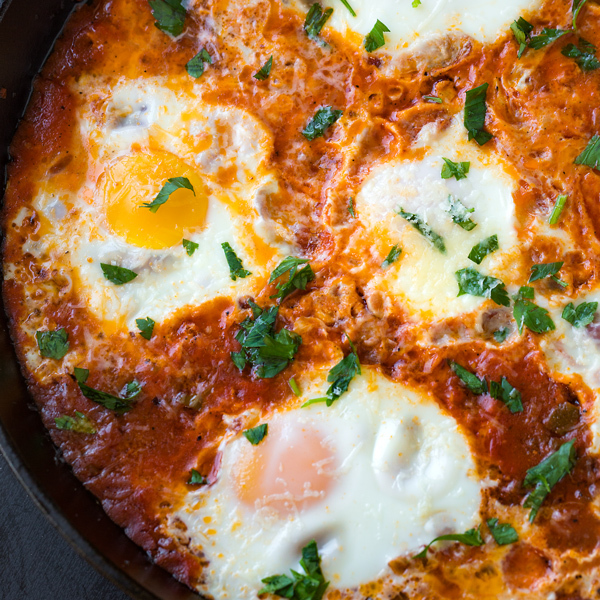 Classic shakshuka (or shakshouka) is a unique and delicious dish of Tunisian origin in which eggs are gently poached in a spicy and rich simmering tomato sauce filled with peppers, onions, garlic and fragrant and warming spices such as cumin and paprika. 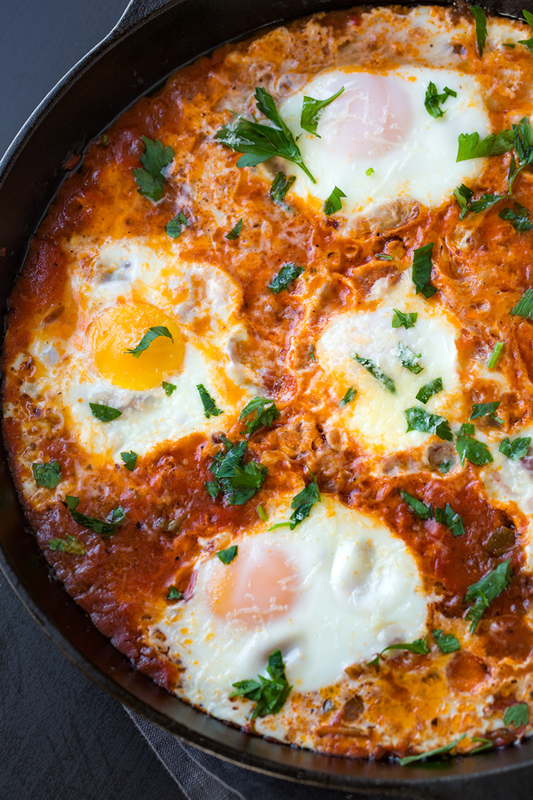 Many countries in the Middle East enjoy their own versions of shakshuka (or “eggs in hell” as this recipe is sometimes cheekily referred to because of the spicy sauce) by adding ingredients that are regional and that contribute other nuanced flavors representing that country, which creates some tasty distinctions in shakshuka recipes. But it’s always served up with some sort of delicious and rustic bread in order to mop up all the spicy sauce and those delicious soft-cooked egg yolks that flow like fine silk once punctured. It’s best to use a cast-iron skillet (or other heavy-bottom pan for good heat distribution) for this recipe, and allow ingredients to first sauté together until golden before simmering gently in the tomato sauce just long enough for it to slightly thicken. Then, you simply add the eggs directly into the simmering sauce, one at a time, and cover the pan for a few minutes until your eggs are cooked to your desired doneness. Finish with your flourishing ingredients such as cheese and herbs, serve with crusty bread on the side, and what you have is a rustic, healthy, and enlivening complete meal, full of rich, spicy flavors and good protein. Make the sauce ahead and re-heat when ready to serve: The sauce element of this recipe is super quick and simple to prepare, but if you’d like even more of a head start, you can prepare it a day or two before you plan on serving the dish. You’d simply re-heat the sauce until simmering in your skillet, and proceed by adding in the eggs and poaching. Crack the eggs into ramekin for a shell-free shakshuka: Bits of egg shell under tooth are no fun; so unless you feel very confident in knowing you won’t accidentally get any egg shell into the sauce, crack each egg into a small dish or ramekin, then slide the egg into the simmering sauce to poach (you can even make a little “nest” in the sauce with a spoon for each to poach in). Go more or less on the peppers depending on your desired spice level: I used 2 Anaheim peppers and 1 whole jalapeño in my recipe, but we like things spicy. If you’re not wanting to go too spicy, or are not sure how spicy the peppers are, I’d recommend using 1 Anaheim and ½ a jalapeño (seeded with membrane removed). You can always add more spice later! Eggs are gently poached until soft in a robust and spicy tomato sauce, then sprinkled with manchego cheese in this Spanish-inspired version of a classic egg dish. -Place a cast-iron skillet or other heavy-bottom pan over medium-high heat, and drizzle in about 4 tablespoons of olive oil; add in the diced onion and the diced Anaheim and jalapeño peppers, plus a pinch or two of salt and pepper, and sauté until slightly golden. -Next, add in the garlic, pimientos, the cumin, both paprikas and the saffron (if using), and stir to incorporate; once aromatic, stir in the crushed tomatoes, along with another pinch or two of salt and pepper, and allow the sauce to gently simmer for about 15 minutes, uncovered, until slightly thickened (at this point, I like to add an additional little drizzle of the olive oil for flavor, as a finisher). -Using a spoon, make 6 little “nests” or indentations to drop your eggs into, and one at a time, slide your eggs into the sauce (or crack them directly in, but see the note in the “Tips & Tid-Bits” section); then, cover the pan and cook for 5-6 minutes for soft, flow-y yolks, or a couple minutes longer for slightly more “set” yolks. -Finish with a sprinkle of the manchego cheese and a few extra herbs on top, and enjoy immediately with good rustic bread to sop up the sauce with. What herbs are recommended to sprinkle on top, cilantro or flat leaf parsley? 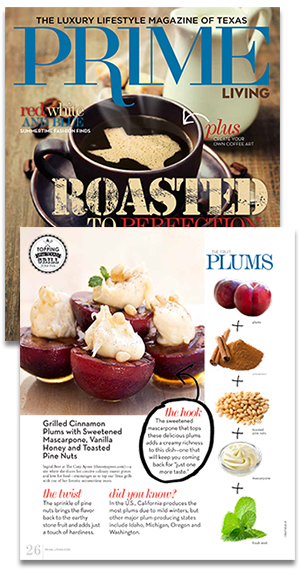 This looks wonderful to make for a brunch. Hi Norma, in the recipe I recommend a bit of flat-leaf parsley and oregano, or one of the two is fine. We sprinkled parsley on ours for the photos. Works wonderfully. Added some spinach and kale that I had left over as well. Hi Ballal, thanks so much for your comments! I’m so happy you enjoyed this tasty and spicy recipe, and the spinach and kale are excellent additions! Thanks for sharing.